Originally known as St. Joseph Emergency Family Shelter. 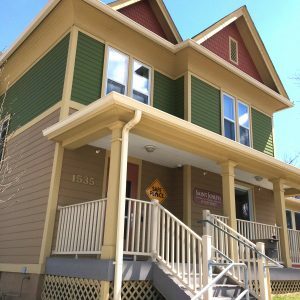 Catholic Charities Emergency Family Shelter keeps homeless families together during a very difficult time in their lives. Our experienced staff understands that homelessness is not a simple issue. While each family is expected to follow the same rules and expectations at the shelter, they are all provided individualized case management. The goal is to help each family leave the shelter with stable housing, financial stability, and empowerment to live a successful, sustainable life. Catholic Charities Emergency Family Shelter is part of Centralized Intake. All families seeking shelter should contact Primary Healthcare Outreach, the Centralized Intake agency in our community, at 515-248-1850.